Watching Miuccia Prada’s latest menswear collection, one thought irresistibly asserted itself: clothes make memories, memories make history. 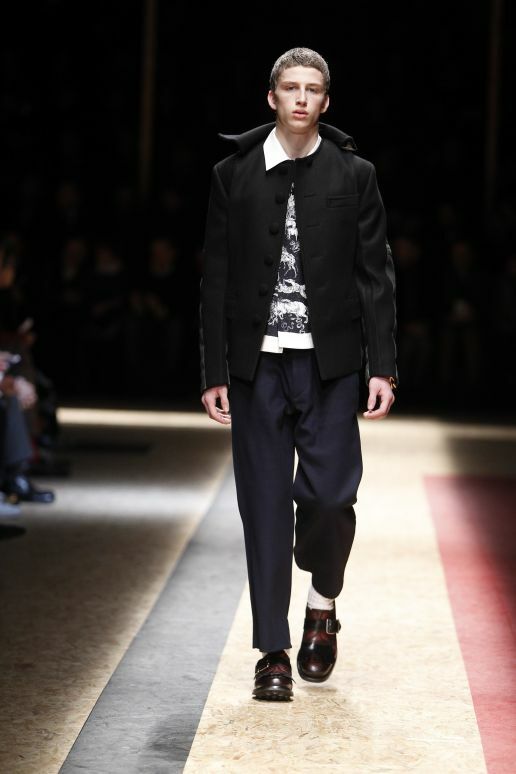 MILAN, Italy — Prada menswear of late has been a little desultory. Rich in ideas maybe, but erring on the side of dreary in the actual delivery. All that changed tonight. Miuccia herself reeled off a litany of positives after her show: “Drama, passion, heroism, romanticism…” The new men’s collection had all that and more. No Prada presentation ever wants for a complex, enthralling backstory. This one was particularly rich. The first looks instantly evoked sailors in their little hats, navy jackets, capes and peacoats. Waxed indigo denims looked like clothes for the working tar, and there were shapely officers’ coats for the men above deck. Fabulous shirt prints seemed to depict gods and monsters, the kind of mythic beings that sailors would spin yarns about when they returned from their travels. On closer examination, one tableau featured the likes of Pasolini, Che Guevara, Nina Simone and Sigmund Freud wrestling with classical figures. Each print was created by young French artist Christophe Chemin. His titles were part of the images (Che, Sigmund et al were named The Important Ones). This blend of historical and contemporary was the collection’s cornerstone. Mrs P said the set was intended to evoke a town square, where people of all backgrounds could mingle. It also looked a little like a courtroom, which fitted with the invitation, designed as a ledger. In that inquisitional vein, by the time models appeared with detached collars and cuffs, I was perfectly happy to think of them as defrocked priests, or at least someone who’d lost their faith. Which, under the strangely romantic influence of the show and its haunting soundtrack, led to Arthur Rimbaud, which led to taking to the high seas to escape an impossible situation at home. From which, it was a short step to the current migrant crisis in Europe. And Mrs Prada was indeed talking about the challenges that confront our humanity in a much more direct way than she would usually, while maybe acknowledging the ineffectuality of fashion in any way other than to divert us. All of this would simply be a huge red herring if it wasn’t for the fact that the clothes themselves were so winning. Historicism updated could spawn a very convincing cape in denim or tweed, or a Napoleonic smock with a botanical print (though it might just have been rotting fruit). There were those beautiful shirts, some wonderful elongated tailoring (the shearling collars again giving something Napoleonic, which would be the heroism that Mrs Prada spoke of). And there was womenswear, a sampling of the pre-Fall collection, with reconfigured sailors’ coats and long, lean dresses, some backless, all paired with diamond-patterned woollen tights, which suggested the girls waiting back home for the fleet to come in. On Frederic Sanchez’s soundtrack, Nick Cave and Kylie Minogue might have been singing « Where the Wild Roses Grow » especially for them. Mrs Prada has always been a political animal, but her politics have rarely been obvious in her work (or should we call it her art?). Her faith in fashion is, however, something quite distinct. Watching her latest collection, one thought irresistibly asserted itself: clothes make memories, memories make history.